I’m going to take a brief break from my current series to babble on a bit about what I did this weekend, which was finish a Greyhound tattoo design for my friend Carol. The first Greyhound tattoo I designed is shown below (click the image to see the full design). I created it several years ago, based on a henna design I used to do at Greyhound events. Pretty nice, huh? I love the color he added. 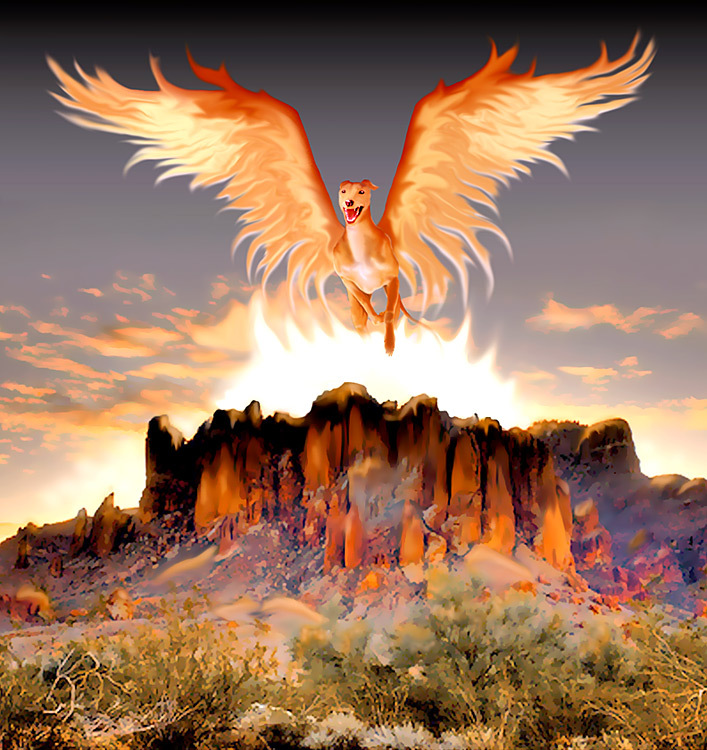 The design I did this weekend was based on an idea Carol got from another friend, which was a Greyhound phoenix – a Greyhound with flaming wings. We discussed it one evening while we were out for dinner. We settled on the idea of the Greyhound phoenix running in the sky over the Superstition Mountains (the mountains east of Phoenix, Arizona), and I did sketches of several different ideas on napkins. She took the napkins with her, and returned the one she wanted a week or two later. That was about a year ago. Bad me. I did start working on it soon after I got the napkin back. I did a sketch, but then I hit a bit of “artist’s block.” I showed Carol what I’d done, and she liked it so far, but every time I tried to work on it after that, the block remained. This week I decided to just sit down and get the darn thing finished. So, on Saturday morning I pulled out the sketch I’d started and tried to work on it, but the block was still there. Clearly, there was something wrong with… something. In a fit of desperation, I threw out the sketch I’d done and turned on my computer to see if creating it in Photoshop might clear up my artist’s block. And, voila, it worked! After working all day Saturday (with a break for dinner) and well into Sunday morning – I got to bed around 3 a.m. – I finished a full-color design that was pretty close to the original sketch. I’m not 100% happy with it, but I think it’s enough for the tattoo artist to do something cool with. I gave it to Carol today and she liked it. She’s going to have it tattooed as a half sleeve. I can’t wait to see the finished tat. Anyway, that’s what I did this weekend. Hurray! I was able to check something off my to-do list. P.S. If you would like to use either design for a tattoo of your own, please feel free to do so. I love to see different interpretations of my artwork, so please send a picture of the finished tattoo to me at mik@mikdesign.com. Thanks! This entry was posted on 26 October 2008 at 8:43 pm and is filed under Art, Greyhound, Phoenix, Photoshop, Tattoo. You can follow any responses to this entry through the RSS 2.0 feed. You can leave a response, or trackback from your own site. I would pay for a t-shirt with this design on it! You should put it on CafePres or even Ebay! I really love the henna based design, I hope you don’t mind if I tweak it a little and use it! :-) I really love it. its beautiful, I just need to tweak it to be a little more suited to an Italian Greyhound and I am going to have it tattooed on my forearm as a tribute to my life saver, my constant companion and service dog – Luigi. Hands down, the best greyhound tattoo I’ve ever seen. Love it!! I agree with Heather’s post. I have been looking for a new piece of body artwork and would like to use this. I would like to add my Grey’s tattoo numbers to it. Thanks for a greyt piece of art! Hi, I just found the pictures of the wonderful greyhound armband you designed. I was looking for ideas to get my own “greyhound tattoo” done. I have two girls and I wanted them to feature in the tattoo but not like a 1:1 portrait. Your design is so lovely. I would so like to use it but I think it is more decent to ask first. Keep going, your artwork is greyt stuff! You’re welcome to use the artwork. If you click on the image in the post, you can access the full design. Please send me a picture of the finished tattoo; I’m putting together a collection of them for a future post. Feel free to use it. I would love to see a picture of it when it’s finished. The armband is so beautiful though…do you have any similar drawings on a lesser scale, or suggestions? Maybe just one grey from the armband. I don’t have any similar drawings, but you’re welcome to take the artwork that’s there and use just a piece of it. I adore the armband! I have a greyhound tattoo in mind but haven’t followed through yet. In the meantime I am always looking out to see what others have done, and yours is one of the best I’ve seen! Please use it however it works best for you. I’d love to have a picture of it when it’s finished. I’m glad I found this! My husband gave me a voucher for a tattoo for my birthday and I have to use it this weekend. I’ve been struggling with what to get. Thanks for giving permission to use it! I’ll be sure to send you a picture. 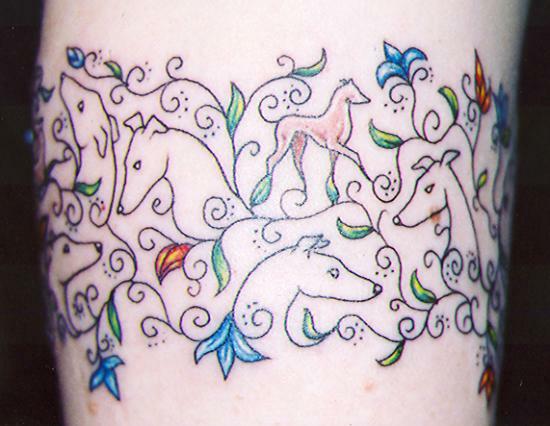 Wow, I have been looking for a greyhound tattoo design for a little while also. Since having my girl, the greyhound has become a part of my heart. Thank you for the inspirational tattoo ideas. I’m sorry to hear about your grey. I’ve had a couple of them with the dreaded bone cancer. Give her a big hug from me and my hounds. Please feel free to use any of my greyhound tattoo designs. If possible, send me a photo of the finished tattoo. I love to see how the different tattoo artists interpret my designs. Thanks! I will do it… :))) Thank you very much, that means a lot for me! Hi, I love permission to use your design as my Facebook wallpaper. May I? The one at the top. It’s black and white with flowers and greyhounds. It appears you gave others permission, so that’s why I’m asking. Sure, you can use it. Thank you!! How shall I list the credit…. “The Greytheist”? Use my name: Mik Wilkens. Thanks! Would love to use that top, black white design for some body art I plan on having done soon. May I? Thank you so much! In memory of my beloved grey & in honor of the breed. So much appreciated! Hi, just found your designs and love them. I do china painting and would like to use your armband art on mugs and possibly plates. We are involved in greyhound rescue and I am painting some items for a raffle that is a fundraiser. May I use this art and if yes what name for credit to you? Hi, I am about to have my first tattoo in memory of my beloved hound Belle. Your armband design is by far the nicest I’ve seen and with your permission I would love to use it.